Lovely story: such a nice boy and so helpful: should think very reassuring to children. There is a lightness and gaiety and a very funny description of how silly we are, one and all. What any child would love to read. Beautifully illustrated with blue blue skies stripes and checks and diamonds.A clever boy wanted to explore further than his village and he asked his mother if he could explore into the next village.‘Yes ‘ she said, ‘If you look both ways crossing the road.’He did look both ways and got to the next village where a large number of people were gathered in a field. Turned out they were afraid of a terribly dangerous animal in the field.The terribly clever boy had a look and saw it was a water melon.Not a terrible dangerous animal he said and went up to it and cut himself a slice.The people in the field were at first terrified. Then pleased he had killed the monster. Then terrified again because he had eaten it; and raw too. Ergo it wasn’t just a terribly dangerous animal, it was a terribly dangerous boy as well.By the time the boy left, the people had stopped being afraid, become interested in what a melon might be and eventually were able to do something constructive, like grow melons eat melons, give melons away, sell melons and were much happier and a great deal less silly than they had been. This folktale about jumping to conclusions and fearing something before we really understand it is utterly delightful AND has fabulously endearing illustrations. My favorite new book to gift to parents. "He's eating the terrible, dangerous animal! He must be a terrible, dangerous boy"A simple story which reminded me of our (Joha), I really liked the pictures in there. A clever boy teaches a village not to fear the unknown. A folktale from the Middle East. The kids LOVED it! Great for teaching about tolerance and not fearing things simply b/c they're unfamiliar. The lesson: Just because you have never seen something before doesn't mean it is terrible or dangerous. 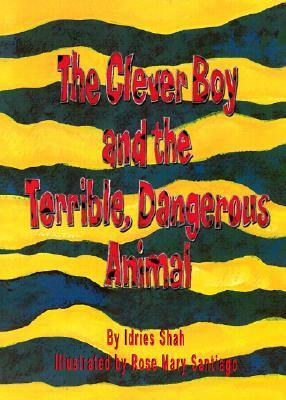 The Clever Boy and the Terrible, Dangerous Animal, written by Idries Shah and illustrated by Rose Mary Santiago. Hoopoe Books, ISHK. (Available on ICDL at http://www.childrenslibrary.org/icdl/... in English, Spanish, Dari, and Pashto. Audio available in English and Spanish).Idries Shah shares this fun and insightful tale that has been passed for years in the oral tradition in Dari and Pashto. This tale is the story of a young boy who visits another village and finds the people there terrified of a dangerous animal the likes of which they had never seen before. Through bravery, and a willingness to share knowledge and understanding, the boy helps the village people overcome their fears and discover something new and wonderful. This book was so entertaining and interesting. Through engaging illustrations and simple, beautiful language, Shah captures the traditional Sufi tale. Through Idries Shah's books he shares with the readers in our classrooms the traditional and familiar tales of the Middle East and Central Asia in a way that is accessible and engaging for them. I love the idea of learning another cultures folk tales to add to the richness of our classroom's language and understanding. This book would make an amazing addition to any class library as bringing in authentic multicultural literature so that we might begin to see the world from a new point of view. Hilarious! The cover is deceiving to build up a little suspense which makes the climax of the story so much funnier. This is a folk tale which is a perfect example of a few things explored in Writers' Workshop: - The use of quotation marks for dialogue- Effective use of onomatopeias in a narrative- How teaching a moral does not have to be a complicated affair.You enjoy the story and on the very last page, bam!, the author makes you do a retake of everything you thought was being said.Love! Love! Love! A very cute Folktale from the Middle East about a young boy who ventures to a new village and finds a crowd of people that are terrified of "a terrible, dangerous animal." It turns out that this terrible, dangerous animal is not so terrible and dangerous after all. This young boy then helps them overcome their fears as he enlightens him with what exactly they are seeing. A great way to illustrate the importance of not needing to fear the unknown, because the unknown may not be so terrible after all. I can't go wrong. I have free-online access to an audio version and the bilingual text via International Children's Digital Library Foundation. More intensive reading. I listen to the audio version twice and now I am going to read and review the Spanish version thoroughly. A clever (listo) boy travels to a neighboring village and laughs at the silly people that live in fear of Ohhhh, Ayyyy Ohhhhhh . . . la sandia, the terrible & dangerous animal that will bite you! "And just think. It all happened because a clever boy was not afraid when a lot of silly people thought something was dangerous just because they had never seen it before. "Shah does it again with a delightful tale of Sufi literature offered for children. It is great to get these tales from the oral tradition onto paper!